• The first-place winning poet receives a $1,000 cash award, an invitation to an awards event on May 20, 2012 at the Swedish Museum in Philadelphia, and publication in this Spring 2012 issue. • The second place winning poet receives a $250 cash award and publication in this Spring 2012 issue. 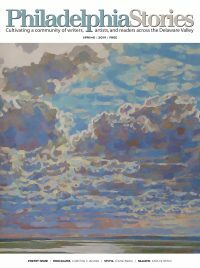 • One honorable-mention winning poet receives publication in this Spring 2012 issue. I only met Sandy Crimmins once-after she read at the Free Library of Philadelphia’s Monday Poets Series. When she died, I was selfishly disappointed that I wouldn’t have the chance to get to know her properly. In my short time as poetry editor at Philadelphia Stories, the subject of a poetry contest has come up regularly. So, when Joe Sullivan approached Carla, Christine, and me about establishing a national poetry prize in Sandy’s honor, we leapt. I have learned from those who knew her better than I that she welcomed and created variety in her poetry. I hope that the poems assembled here reflect and augment her legacy. We heard from well over a hundred poets and read about five hundred pages of poetry in ten weekly batches. We didn’t have an easy task. Less desirable was the task we presented to Major Jackson, who selected our winning poems. Jeanann Verlee’s “Hereditary” is a terse, taut piece that clatters with the anxiety of its speaker. I haven’t made up my mind about the connection between word and flesh, but I itch reading this piece. Verlee’s words move quickly off the page and into the body of the reader. Steven Harbold’s “The Painting” asks questions about memory and the ability of art to recreate or even reflect memory. It ends with what is probably my favorite stanza of the competition. Not only is the concept here challenging and fascinating, but the formal elements are executed beautifully. Thank you to Christine and Carla for their trust and support throughout this process; to interns Mirabella Mitchell and Sam Lasko; to the amazing Major Jackson for his scrutiny; to the poetry board for their patience and attention, and to Joseph Sullivan who so generously sought to create this opportunity for poets. Thank you to the poets who submitted their poetry to us and who carry on the work that Sandy so ardently believed in. Finally, thank you to Sandy Crimmins for being the kind of poet and person so many others want to celebrate.